When I started at TravelBird I joined the CRM team, which was mainly focussing on keeping the base of existing travellers happy and retargeting uninspired travellers. At this time the TravelBird platform was in early stage and main way of communication was via e-mail, which brought 70% of the net revenue at that time. As a team consisting of two analysts, a developer, project manager I was the designer to help out with all the (A/B) tests and improvements running that time. Of course as a team we had a lot of brainstorms and meetings about what the key objectives needed to be and how we could solve problems.Fun thing about this time was that we could learn quite quick from adaptions we did and leaded this back to decisions we made. One of the bigger projects of that time was mapping the customer life cycle, and see where and when we could improve or add moments with our travellers the different stages of dreaming, discovering, booking and after booking a trip. 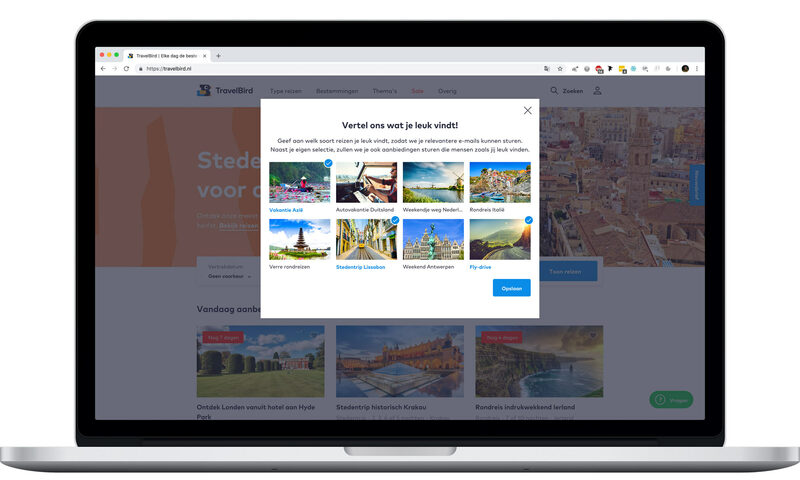 With this came a whole new improved and redesigned modulair email set we used in all kind of different user flows, of which the daily email got sent to over 4.000.000+ travellers each day. One of the projects which came out of the life cycle was the Onboarding of new travellers. Which consisted of different tracks, depending where the users came from. When I started working at TravelBird there has always been a hard pop-up which asked if you already were subscribed to the newsletter. You could not click it away to continue the site, but there was one tiny line at the bottom which said, ‘I’m already subscribed’. We tested and improved the pop-up, so the bounce rate was not so drastically anymore but in a way people still subscribed to our newsletter. When they subscribed we also asked them in a easy way what their interests are, so we could provide them personalised offers. This part could be changed when logging in to the site. 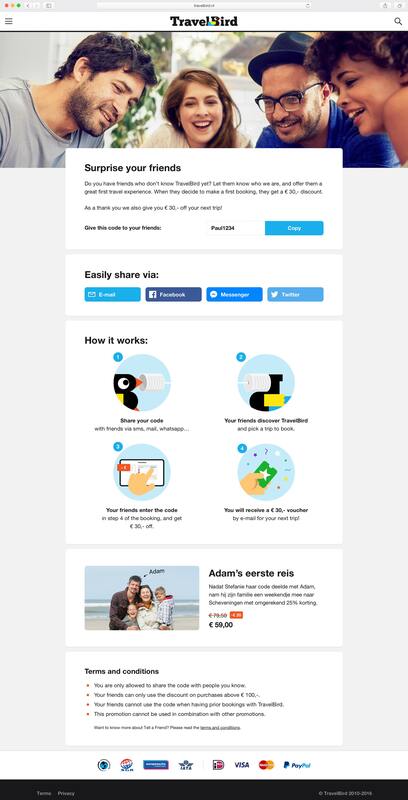 The first email subscribers we expanded with some information about us, the team, why choosing for us and what’s in it for them (when we subscribed them via leadbuying). This also gained trust, which worked in conversion. Another big project which came a little later was something we saw happening at Uber. They gained a lot customers by their Refer a friend campaign. We thought this would work for TravelBird as well, but unfortunately it didn’t work too well as we thought. Because of a lot of legacy we had with the TravelBird platform, to make some decisions which would be crucial for customers to use the tool. This contained counting up money of multiple referrals, so you could save your free holiday. Qualitative user research research also told us the amount of money which we gave by referring a friend and the discount the friend got by making their first booking was too little to make impact. Looking back, Uber basically gave a free ride, but of course, we could not give a free holiday per referred person. Over all a cool project, which is still online. But which never had the potential we hoped for. Refer a friend landing page.